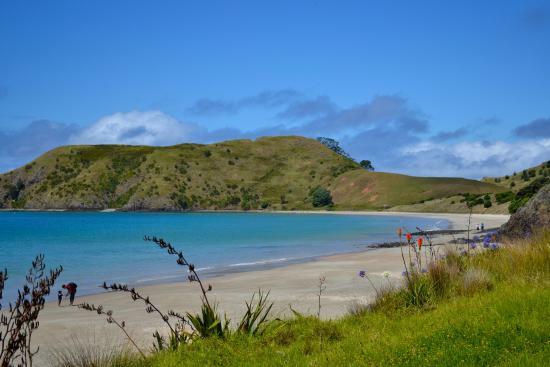 Opito Bay is one of the most sought-after holiday destinations on the Coromandel. A sweeping white-sand beach dominates the area - safe for swimming, fishing, water-skiing, snorkelling and surfing. Boat launching is achieved off the beach in most conditions and the nearby Mercury Island Group provides a backdrop for productive fishing and magnificent diving. Opito Bay is reached by a mostly unsealed road (Black Jack Road) from Kuaotunu. The first Maori settlements were established at Opito some 650 years ago. In the 1880’s Moa bones were discovered and there are a number of archaeological sites from the early days of native colonisation. Opito Point Pa was first established in the 1500s and the local Ngati Hei tribe withstood hostile raids well into the 17th century. Captain Cook visited the Bay in 1769 but was unaware of the existence of Opito Point Pa. During the early 1800’s local Maori sustained repeated attacks by Ngapuhi and many local settlements were left to ruin. Access onto the pa is via a staircase-track at the eastern end of Opito beach. Ditches, pits and terraces remain intact and are clearly visible. Opito now boasts a variety of quality holiday retreats. Opito Bay is sheltered by pohutukawa trees, some over a century old, and has reserves, picnic spots, tables and public facilities ideal for family relaxation. There are breathtaking views of Rabbit Island and Great Mercury Island (Ahuahu). Opito Bay is famous for its scallops. Are you a scallop fan? If so you might want to check out the Whitianga Scallop Festival held annually.